My husband and two boys love biscuits. Growing up I never remember my mother making biscuits, so they were never something that I learned to make well. That all changed when I moved to a part of the country that loves biscuits and has a whole chain of restaurants geared specifically towards the item. My first couple of attempts were less than successful, but slowly I learned to make a decent breakfast biscuit; I'm still after eight years working on perfecting my gravy. The July/August issue of Food Network Magazine had a recipe for Lemon-Thyme Biscuits, which looked different than my normal biscuit routine and perfect for my biscuit loving family. This recipe has 9 ingredients and is very easy to put together. The total cooking time is approximately 40 minutes, with 25 being active. All the ingredients are basic and the majority I already had on hand in my pantry cupboard. 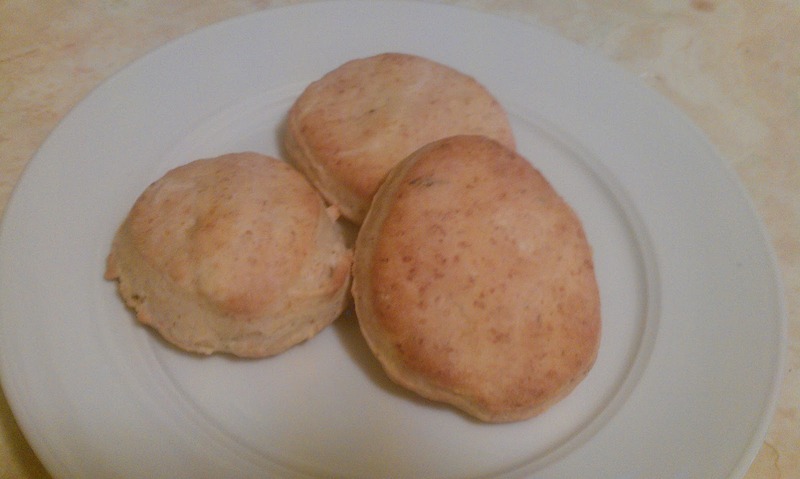 I made the recipe as stated, with the exception that I left off the chopped thyme on top of the biscuits. I left off the thyme since I am baking for a 2 and 5-year-old in addition to my husband and I, and they are a little more picky on the use of fresh herbs. My baking time was a little longer than the suggested 12-15 minutes due to the fact that I refrigerated my dough before cutting. My biscuits took approximately another 5 minutes to finish baking completely. These biscuits turned out delicious. I wasn't sure how my two boys were going to react to the fresh thyme and lemon in the biscuits, but they absolutely loved them! Not only did they eat their servings for dinner, they ate the remainder for breakfast the next day. My husband and I loved how well they complimented the baked chicken that I prepared as a main dish. These biscuits would make a great side to a variety of dished and have a delicious savory taste. For the recipe go to Food Network Magazine Lemon-Thyme Biscuits. Looks Yummy. I love trying out new recipes. MBC member - thanks for following. mmmm! These look and sound incredible! Can't wait to try! @emily grace Thanks! They were delicious! Those look delicious! I am a hopeless chef, I envy you foodie mama's skills! Thanks for visiting me at Happy Hour, I'm a follower!